How many of us have had this conversation with our consultant or member of our IBD team? I’ve had countless appointments and telephone consultations, even emails; where we have discussed new medication that would be of benefit to me, as the patient, to help reduce or elevate the current symptoms of my Crohn’s disease. But, how many of us, really understand the implications of X Y or Z that we are asked to take? And for a while, in that period where you’ve been diagnosed; and are trying to wrap your head around all these new things, you do what is asked of you. You appreciate the experience of your consultant, their expertise in the field and trust their judgement. You sometimes take things because you want to feel relief and the ‘side effects’ are lower down on the priority list; they get mentioned in passing but they are not the crux of your scheduled ten minute window with them. But, it is an important part of the patient doctor relationship – having conversations about what could possibly happen, if not the ‘norm’ or ‘expected’ result or response. Is the benefit worth the risks? When do the risks outweigh the benefits? When do you decide to call it quits on something or when do you decide to roll the dice? What factors and information make this happen? What is considered when making these decisions? Q1: When would you ‘quit’ a medication? Almost 70% responded with “when side effects impacted on Quality of Life” – placing the scale of being able to live well with the effects of the medication above test results, the guidelines for said medication and even an increase in IBD symptoms – the one thing a medications should be giving some relief too. 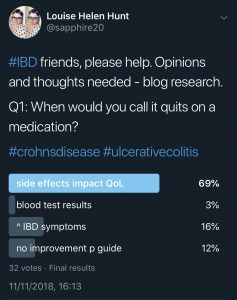 It’s interesting to note that QoL has such a high response – whilst we know IBD is life long and chronic, being able to live well with it is such a key aspect of good IBD care in recent years. There is room for what is acceptable and what is not, and this does vary from patient to patient. And whilst we can be guided by the manufactures guidelines, IBD standards and patient leaflets; what we find is that most of what is achieved is from a ‘gut’ feeling. I’ve had these myself – I knew when my Methotrexate wasn’t working. I knew when my Infliximab antibodies were high and my response was low. I knew that I didn’t want experimental treatment like Thalidomide before surgery. Having a choice, being able to decide, that’s the wonderful yet most difficult part of being a chronically ill patient. Q2: Who’s decision is this? 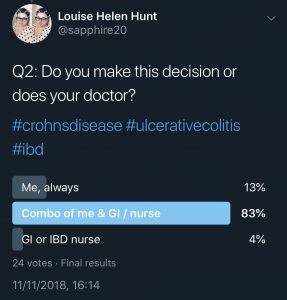 Just over 80% responded with “a combination of myself and Gastroenterologist and / or IBD nurse” when it came to deciding to remove a medication from the treatment plan. I’m very grateful to see this so high! I do wonder if this as high in the newly diagnosed patients? I see the combination of my IBD team and myself as being one of my greatest achievements with IBD. Building that professional relationship, earning the respect and being able to communicate myself effectively has been a challenging but worthy aspect of my care. I know that this was something I developed not because I had to – from a bad experience – it was something that was encouraged. And I can see its benefits, seven years down the line. I did expect my first GI to guide me, but soon, it was me taking the ropes – learning what I could, researching, asking questions, being honest, exploring as we went along. However, those ten minute windows of time we had every 8 or 12 weeks; they didn’t do enough – it was the emails, the phone calls that pulled things together. Effort. Q3: What side effects would you ‘expect’ to experience and still continue the medication? And just over half responded with “this depends on the medication” – which is a fair assessment. Whilst it can be very cut and dry, black or white when it comes to the hard facts and statistics regarding medication side effects; this concludes that the medication itself – and it would seem its benefits – would have to be weighed up when continuing to pursue an aggressive path. I have included some further reading because whilst there are commonalities of side effects for all IBD medication, it is important to understand and realise the real risks of individual medications. Whilst side effects do happen – they are detailed in the medication leaflet as well as within patient information packets, for this exact reason – it is a personal decision whether or not what you experience is suitable to you and your needs. For example; a drowsiness from taking stronger painkillers is, for me, an accepted risk because they do reduce my pain overall. However, some thing like vision issues or difficultly with breathing, would be something I would stop a medication for. Unfortunately, when it comes to some medications, you don’t know how you’ll react until you begin to take them. And whilst you might experience side effects, they should resolve themselves once the medication is embedded in your system – between 5-7 days, if taken daily. With more potent medications – the opiates, biological treatments and immunosuppressants needed to treat severe cases of IBD – the risks are higher, can be multifaceted and can cause long-term damage. 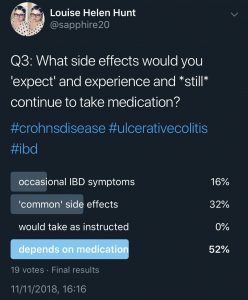 Whilst this is a difficult thing to contemplate; the future implications of taking a medication to resolve your IBD symptoms; it mustn’t put you off from taking a risk that both your IBD team and yourself deem necessary for that moment in time. But, also, being aware of the long-term effects or damage is always an important aspect to reviewing your own care and being involved. There is complacency and then there is negligence. Management – or it’s difficulty to manage – does this particular medication fit in with your lifestyle? Are you happy to do this at home or would being seen at hospital help? Likewise, the other way around – would home be suitable and less stress? You always have a choice! It might sometimes be a limited choice but it is a choice. Loss of response – what happens if you loose response, how will this be assessed? Is there an established routine for amending the dosage or frequency? Are there NICE guidelines or is this hospital policy dictation? Impact on Quality of Life – will this medication have a positive impact? How will you know if it’s having a negative one? Is a negative impact short-term or long-term? Would this be assessed by yourself or an IBD nurse via the CDAI (Crohn’s Disease Activity Index)? Disclaimer: This information is based on my own personal experience with Crohn’s medications and should not be used as medical advice. My medication regimes and processes are part of the IBD protocols set out by NICE, the CCG overseeing the NHS Trust and my specific hospital/s. If you seek advice regarding the medications best suited to your condition or indeed any discussion about side effects of particular medications, changing or removing them, please contact your IBD team for medical advice.